Blanche Savidge Showers Baker of North Huntingdon, went home to be with the Angels Thursday May 31, 2018 at Woodhaven Care Center, Monroeville. She was born in Sunbury, a daughter of the late Henry and Mary (nee Savidge) Showers. In addition to her parents, she was preceded in death by her husband, James J. Baker; Uncles George Savidge and Dr. S. Luther Savidge; Aunt H. Blanche Savidge; also, brothers-in-laws and sisters-in-laws. She is survived by her daughter, Blanche Elaine Baker, sister-in-law Jane Gira, also many cousins, nieces and nephews. She was a member and Past Royal Matron of Jeannette Court Number 25, Order of the Amaranth, and an honorary member of Ft. Augusta Court Number 127, Sunbury, and Corinthian Court Number 35, Penn Hills. She was a Grand Historian 2016-2017. She was a member and Past Matron of Corinth Chapter Number 229, Pitcarin, Order of the Eastern Star. She was also a Past High Priestess of Allah Court Number 2, Pittsburgh, and a member of Isis Court Number 1, Wheeling, WV, Ladies Oriental Shrine of North America. 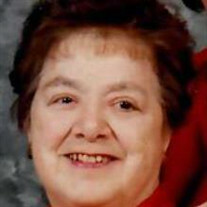 Family and friends may call from 2 to 4 and 6 to 8 p.m. Saturday at the William Snyder Funeral Home, 521 Main Street, Irwin, 724-863-1200, where an Amaranth Service will be conducted by Jeannette Court at 7 p.m. Additional visitation will be held from 4 to 8 p.m. Sunday and 10 to 11 a.m. Monday at the Joseph W. Epler Funeral Home, 210 King Street, Northumberland, PA 17857, where a service will follow at 11 a.m. Interment will follow in Riverview Cemetery. In lieu of flowers, contributions may be sent to the Amaranth Diabetes Foundation. Checks to be made out to: Grand Court of PA, O of A, with a note in the memo “In memory of Blanche S. Baker, ADF Charity Project”. Please send to: Mrs. Patricia Pavlik, PGRM, Charity Project Chairman, 3448 State Route 103 North, Lewistown, PA 17044. For online condolences please visit snyderfuneralservices.com. To send flowers or a memorial gift to the family of Blanche Savidge Showers Baker please visit our Sympathy Store. "Lois Ann Amiano" || "Mrs. Rosalie Duncan"